The library invites all bakers/architects to take part in our first holiday-oriented contest that’s easy on the eyes and sweet on the tongue. The South Slidell and Madisonville Branch Libraries will host their inaugural Gingerbread House Contest on Saturday, Dec. 15 from 9 a.m. to 4 p.m. The theme options are either "Gingerbread Story Land" or a "St. Tammany Parish Scene". 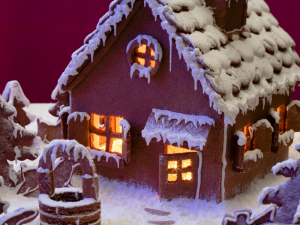 Several age competitive categories will be open to gingerbread house bakers. Along with a kid’s category (up to age 11), there will be categories for teens (ages 12-18), adults (19 and older) and another for family entries, with options to work individually or in a group. "First place prizes will be awarded in each of the categories," Rifino added. The creations will be judged on appearance, creativity/originality, usage of materials, difficulty of design and commitment to theme. Registrants must be present for judging. Other rules and regulations apply. Rifino said the Official Rules and Guidelines are available at the library and on the library website. “We’re excited to host this and hope we have a lot of folks who want to participate,” Rifino said. Space is limited; registration is required by calling the hosting branch: Madisonville at (985) 845-4819, or South Slidell at (985) 781-0099. The last day to register will be Wednesday, December 12.